Lorac Pro Palette - Swatches, Makeup Looks, and Review! One of my "must-have" items when I went on a big shopping trip to the states was a Lorac palette! This is brand that is not available in Canada and it is so well reviewed - I had to get my hands on something from them! I went with the Pro palette - it has a great mix of colours and is actually a fair bit different than any of the other palettes I have, making it a great addition in my collection! The Lorac Pro Palette also came with a sample of the Lorac Behind The Scenes Eye Primer. Lorac Pro Palette ~ $44.00 US. Go PRO with the LORAC PRO Palette! Created by celebrity makeup artist Carol Shaw, this PRO artistry palette is packed with 8 shimmer and 8 matte eye shadows in all the shades you need to create the hottest looks straight from the Red Carpet. LORAC's velvety-smooth shadows are infused with soothing botanicals and are ultra-pigmented to perform wet or dry so you can shade, shadow, line and define your eyes, just like a PRO. PRO Palette contains 16 Eye Shadows and a Mini Behind The Scenes Eye Primer for stay-true color that lasts, a PRO must-have! I really love that this palette included an equal amount of matte and shimmer eye shadows that coordinate with each other. This is a mixture of cool and warm toned shades, and I like the options of both in a palette to create multiple different looks! These shadows are so beautiful and super-soft, buttery like! So smooth, they glide on the skin and are highly pigmented! The top row is all matte and the shadows have very straight-forward names so you know what they are! They all apply very smooth and only the black is a touch patchy which can generally be expected in darker shadows. The bottom row is all shimmer shadows and these are absolutely gorgeous! The gold shadow holy moly - so amazing! I created both a day and an evening look to give you an idea of how versatile the palette is. I used the Lorac Eye Shadow Primer prior to applying both looks! 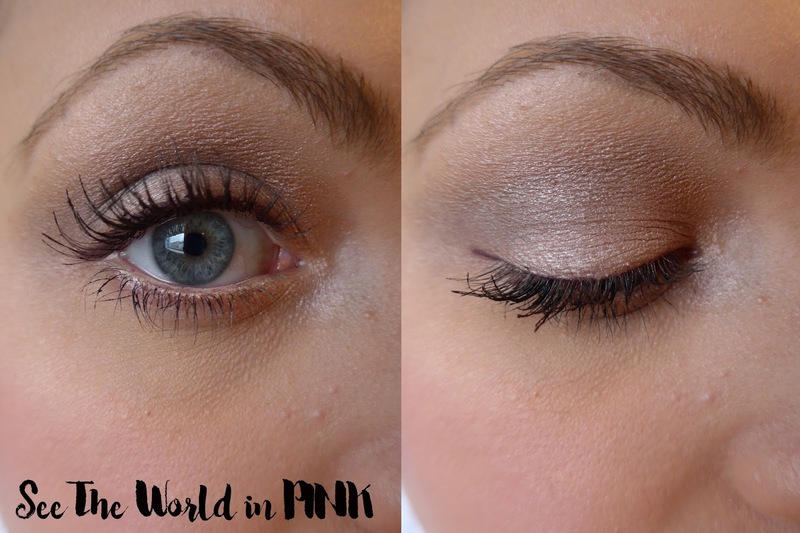 Day Look: Cream under the brow, Mauve and Pewter in the crease, Champagne on the lid. I completed the look with a brown pencil eyeliner and 2 coats of Rollerlash Mascara. 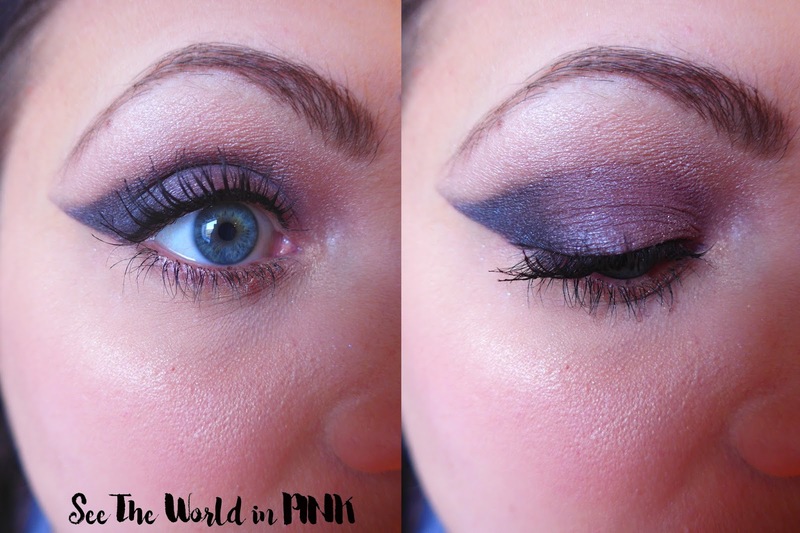 Bold Evening Look - Cream under the brow, Light Bronze high in the crease, Deep Purple and Slate for the wing, Slate with Pewter for the lid. I finished the look with Stila Stay All Day liquid eyeliner and Benefit Rollerlash mascara. I have to say that the Lorac Pro Palette was a solid purchase - I love how soft and luxurious the shadows feel! They are also highly pigmented and show up well on the lid! The palette is versatile and I really like the variety of shades and tones included! I would highly recommend this palette, especially if you have not tried Lorac shadows before! Looks like such a great palette! I have the Pro 2, but I don't use it enough! I really checked out the Pro 2, but I knew I would use this more! April 2016 Ipsy Glam Bag Review and Unboxing!